With the transformation of the Venezuelan landscape in recent decades, the figure of the motorcyclist (motorizado) has become almost omnipresent not only in the largest cities, but also right in the countryside. Last December, while travelling to Merida through the TrasAndina roadway, the car made a technical stop in Barinitas. During that brief time I could see how motorcycles outnumber cars in the streets by 3-to-1. Motorizados are not a recent phenomenon, in fact there was a local movie about them back in the 70’s. They’re not just part of everyday traffic, but a full-fledged element of our society. Even in the 2012’s presidential campaign, the late comandante presidente was transformed into some sort of criollo “ruff rider” (along other popular youth figures). But in recent years, motorizado has also become codeword for trouble … for many reasons. 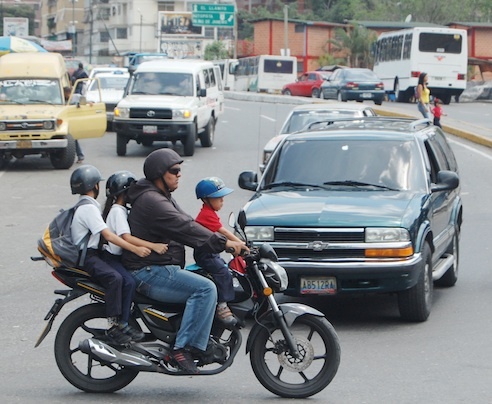 Venezuela has become one of the countries with the worst traffic-related death rates on Earth. There are many reasons behind that dubious achievement, but recently the number of accidents involving motorcyclists has sky-rocketed. In fact, some specialists have called for this to be treated as a “public health issue,” asking for the government to take action. The issue doesn’t quite stop with the accidents themselves, but with their violent aftermaths. This is not only a matter of public health alone, but also one which is related to our public safety: many of the crimes committed (an expert put it around 90%) nationwide somehow involves a motorcyclist, either as the main perpetrator or as an accomplice. There are stories of motorizados following people out of banks and taking their money, or robberies in crowded roads in the middle of rush hour. Even when they’re laying one of them to rest. At the core of this problem is the lack of clear rules. The set of regulations to oversee motorcyclists have been delayed for more than two years, even if they were published in the Official Gazzette. The excuse behind it has been “lack of proper consultation and debate”. Some State Governors have tried to solve this legal vaccum but have faced opposition from the central government, organized groups of motorists, and the courts. There’s no exact number of how many motorizados are in Venezuela, as the national census to register them is about to reach its second ongoing year this October. The latest official estimate is around 261 thousand and counting, but some experts believe there are more than double that figure. The reason? Sales of motorcycles have increased, as it’s more easier now to buy a new motorcycle than a car. That explains why motorcycles are robbed more often. There’s a public outcry for clear rules for motorizados, even among some groups which represent them. but this must come as part of a larger effort to improve traffic, public transportation and road safety. And yes, the elephant in the room has to be included.